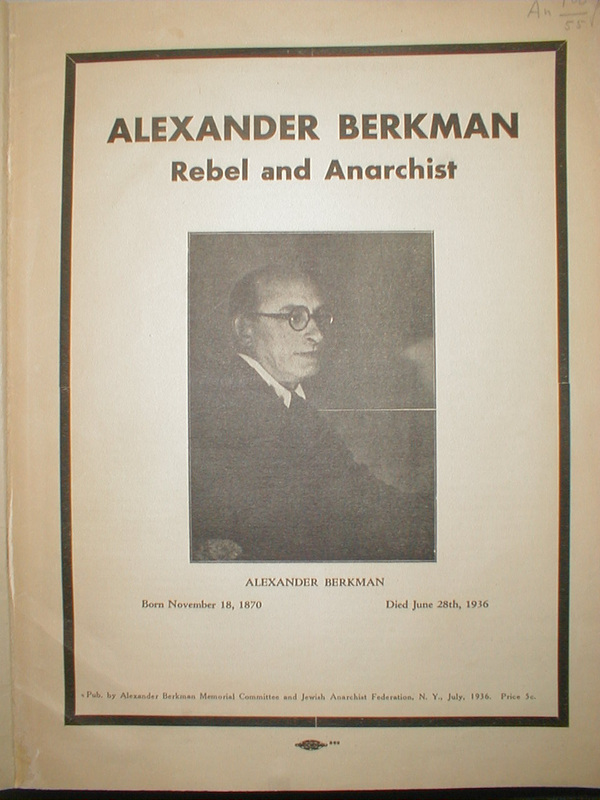 This pamphlet is part of the International Institute for Social History's Alexander Berkman archive and appears in Anarchy Archives with ISSH's permission. Pub. 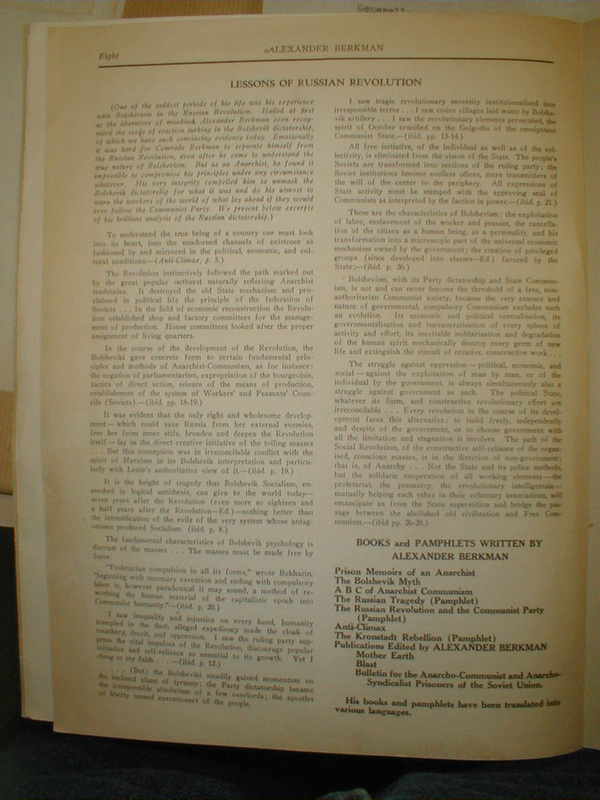 by Alexander Berkman Memorial Committee and Jewish Anarchist Federation, N.Y., July 1936. Price 5c. This letter, received in this country just three days before his death, furnishes the most startling and most convincing evidence of our comrade's devotion to the Cause. 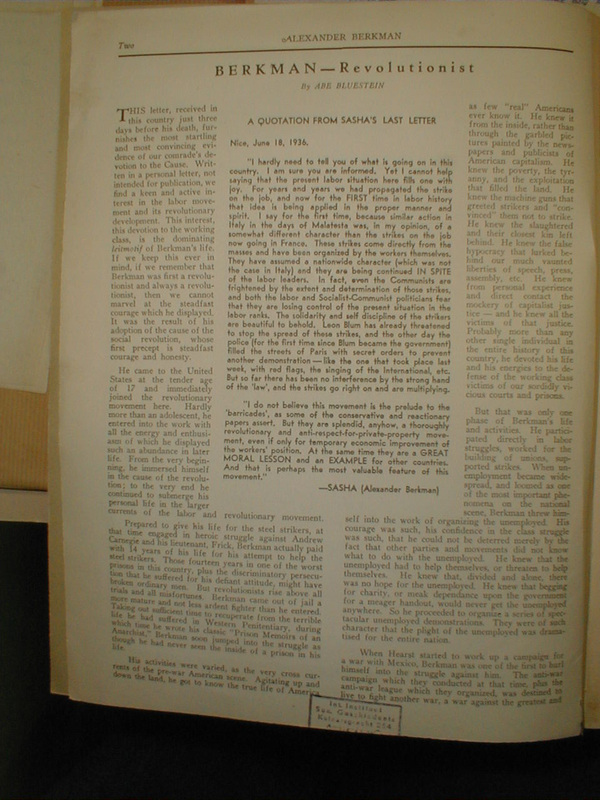 Written in a personal letter, not intended for publication, we find a keen and active interest in the labor movement and its revolutionary development. "I hardly need to tell you of what is going on in this country. I am sure you are informed. Yet I cannot help saying that the present labor situation here fills one with joy. For years and years we had propagated the strike on the job, and now for the FIRST time in labor history that idea is being applied in the proper manner and spirit. I say for the first time, because similar action in Italy in the days of Malatesta was, in my opinion, of a different character than the strikes on the job now going in France. These strikes come directly from the masses and have been organized by the workers themselves. They have assumed a nationwide character (which was not the case in Italy) and they are being continued IN SPITE of the labor leaders. In fact, even the Communists are frightened by the extent and determination of those strikes, and both the labor and Socialist-Communist politicians fear that they are losing control of the present situation in the labor ranks. The solidarity and self discipline of the strikers are beautiful to behold. Leon Blum has already threatened to stop the spread of these strikes, and the other day the police (for the first time since Blum became the government) filled the streets of Paris with secret orders to prevent another demonstration --- like the one that took place last week, with red flags, the singing of the International, etc. But so far there has been no interference by the strong hand of the 'law', and the strikes go right on and are multiplying. "I do not believe this movement is the prelude to the 'barricades', as some of the conservative and reactionary papers assert. But they are splendid, anyhow, a thoroughly revolutionary and anti-respect-for-private-property movement, even if only for temporary economic improvement of the workers' position. At the same time they are a GREAT MORAL LESSON and an EXAMPLE for other countries. And that is perhaps the most valuable feature of this movement." This interest, this devotion to the working class, is the dominating leitmotif of Berkman's life. If we keep this ever in mind, if we remember that Berkman was first a revolutionist and always a revolutionist, then we cannot marvel at the steadfast courage which he displayed. It was the result of his adoption of the cause of the social revolution, whose first precept is steadfast courage and honesty. He came to the United States at the tender age of 17 and immediately joined the revolutionary movement here. Hardly more than an adolescent, he entered into the work with all the energy and enthusiasm of which he displayed such an abundance in later life. From the very beginning, he immersed himself in the cause of the revolution; to the very end he continued to submerge his personal life in the larger currents of the labor and revolutionary movement. Prepared to give his life for the steel strikers, at that time engaged in heroic struggle against Andrew Carnegie and his lieutenant, Frick, Berkman actually paid with 14 years of his life for his attempt to help the steel strikers. Those 14 years in one of the worst prisons in this country, plus the discriminatory persecution that he suffered for his defiant attitude, might have broken ordinary men. But revolutionists rise above all trials and all misfortunes. Berkman came out of jail a more mature and not less ardent fighter than he entered. Taking out sufficient time to recuperate from the terrible life he had suffered in Western Penitentiary, during which time he wrote his classic "Prison Memoirs of an Anarchist," Berkman soon jumped into the struggle as though he had never been inside of a prison in his life. His activities were varied, as the very cross currents of the pre-war American scene. Agitating up and down the land, he got to know the true life of America as few "real" Americans ever know it. He knew it from the inside, rather than through the garbled pictures painted by the newspapers and publicists of American capitalism. He knew the poverty, the tyranny, and the exploitation that filled the land. He knew the machine guns that greeted strikers and "convinced" them not to strike. He knew the slaughtered and their closest kin left behind. He knew the false hypocrisy that lurks behind our much vaunted liberties of speech, press, assembly, etc. He knew from personal experience and direct contact the mockery of capitalist justice -- he knew all the victims of that justice. Probably more than any other single individual in the entire history of this country, he devoted his life and his energies to the defense of the working class victims of our sordidly vicious courts and prisons. But that was only one phase of Berkman's life and activities. He participated directly in labor struggles, worked for the building of unions, supported strikes. When unemployment became widespread, and loomed as one of the most important phenomena on the national scene, Berkman threw himself into the work of organizing the unemployed. His courage was such, his confidence in the class struggle was such, that he could not be deterred merely by the fact that other parties and movements did not know what to do with the unemployed. He knew that the unemployed had to help themselves, or threaten to help themselves. He knew that, divided and alone, there was no hope for the unemployed. He knew that begging for charity, or meek dependence upon the government for a meager handout, would never get the unemployed anywhere. So he proceeded to organize a series of spectacular unemployed demonstrations. They were of such character that the plight of the unemployed was dramatised for the entire nation. most destructive war mankind has ever witnessed. Nor did it matter that an entire nation was overcome with an insane hysteria. Berkman saw his duty as a revolutionist and fought with all the resources at his command against the overwhelming odds of a powerful government, a well organized press, and every agency for propaganda a wealthy capitalist society could muster. His own fate did not count in the balance, nor did that of his closest comrade, Emma Goldman. Both were prepared to give their own lives in the greater struggle to save their fellow man from a hideous and unnecessary slaughter. And when they were deported they did not regard it as a personal misfortune. They welcomed the opportunity to go to Russia and join in the great work of reconstructing a new society on the ruins of the old. They rejoiced that at last their great objective had been achieved, at least in one country. With open hearts and open minds, they greeted the victory of the Revolution and the Bolsheviki, the most dominant party of the time. Gladly they went there to work with them. But their trials as revolutionists and as Anarchists were not to end so smoothly. A period of observation to place. Little by little they began to notice things that made them uneasy. 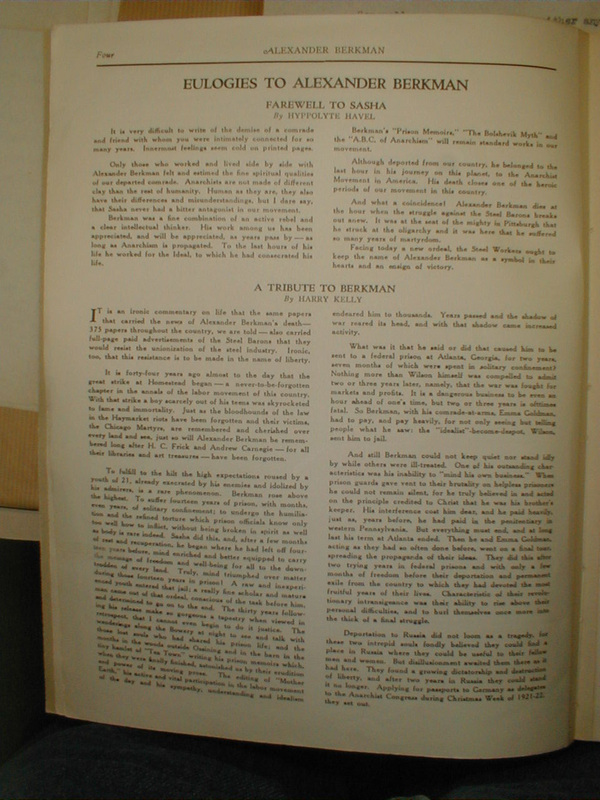 But it took them two years (a long time in such a period of storm and stress, with major developments occurring over night and history proceeding by leaps and bounds) to become convinced that the Bolsheviks had perpetrated a ghastly crime upon the Revolution and was making shambles of all its aspirations. It took so clear-cut and harsh a blow as the Kronstadt massacre to finally convince them that they could no longer identify themselves with the Bolsheviks. This was probably the most trying period of Berkman's life. To have striven all his life for the Social Revolution, to have taken that broad non-partisan attitude of welcoming the Revolution no matter what party "lead" it, to have gone there prepared to work for the new society and live in a truly free society, to be welcomed for the intrepid revolutionist that he was by the leaders of the Russian Revolution, to be offered an honored place in the new revolutionary system--and to have to turn one's back upon all this. To be forced to leave this sanctuary for revolutionists and wander back to the tender mercies of capitalist governments, -- what more trying moment could there be in the life of a revolutionist. Many failed at this crisis, forgot some of their principles and overlooked their scruples. But they were just men, men of opportunistic clay. Revolutionists have their principles and cannot consider such a choice as private fortunes versus revolutionary principles. They must remain true to their colors. They cannot do otherwise. So Alexander Berkman and Emma Goldman left Russia and took up a life of exile in hostile countries. Deprived of the right to have a home, they have existed during these long and trying post-war decades without being able to strike root in their new surroundings and joining in the struggles of the proletariat against their new conditions of slavery. This enforced inactivity, arbitrary compulsion to remain silent when they would have liked to speak out, probably hurt far more than any personal privations they had to undergo. For we must remember and burn it into our memories with letters of unquenchable fire, that our comrade was before all things a revolutionist. This steady vision, this unfailing devotion to the Cause of the Social Revolution, does not hold us in awe. His ability to become so enthusiastic over the recent strikes of the French workers, under the conditions of his life in those last months of tragic illness, divorced as he was from direct contact with the workers despite the fact that he resided in France, furnishes us with the final proof of his great courage and intense and eager interest in the revolutionary movement. His enforced isolation did not separate him from the working class. He followed the fortunes and struggles of the workers of the world closely and shared intensely their every experience. If governments can prevent his taking an active role in the life and battles of the working class, they could not prevent him from associating himself with the workers in all his thoughts and hopes. Nor was he, as the bourgeois press intimated, forgotten by his comrades all over the world. He has earned an immortal niche for himself in the hearts of his fellow workers, a niche of love, of respect, of intimate comradeship with thousands of men and women all over the world. Even those who have never had the good fortune to meet him personally, know him and love him through his books and his life. His life is one of the finest chapters in the Lives of Proletarian Revolutionists that has ever been written. And we are grateful to the author. The fact that he did not live to see a truly a Libertarian Revolution carry the workers to their emancipation does not make his life a failure. Revolutions are too big to be made by single men and in a single generation . Revolutions come into life long after the seed has been planted by countless numbers of heroic men and women. Therefore no one considers the efforts, the sacrifices and the lives of these generations of Russian Revolutionists, who gave their all for the overthrow of czarism, a failure because czarism did not fall in their day. Certainly no one can not deny that their work contributed to the downfall of czarsim. The history of revolution is the same all over the world. Countless lives must be consecrated to the Cause before the Stream of the Revolution can be transformed into a raging and all powerful torrent, sweeping everything before it and carrying the working class to victory. Berkman's contribution to that stream was a great one. His name and his work will live long after him. Long after all of us have left this world behind, the name of Berkman and the work of Berkman will live in the minds and hearts of the working class. Just as the earlier revolutionists served as the inspiration and source of strength for Berkman in his youth, so today we draw our strength, our courage, and our faith in our ideal from the life of our dear comrade, Alexander Berkman. And we say of him as we said of those earlier rebels: " Whatever the misery and torture of their daily existence, the politicals -- even in Siberia -- drew courage and strength from the inspiration of a common cause . . . I shall not disgrace the Cause!" Nor minutes, nor tic-tocs. Which taxed heart and mind. It is very difficult to write of the demise of a comrade and friend with whom you were intimately connected for so many years. Innermost feelings seem cold on printed pages. Only those who worked and lived side by side with Alexander Berkman felt and estimed the fine spiritual qualities of our departed comrade. Anarchists are not made of different clay than the rest of humanity. Human as they are, they also have their differences and misunderstandings, but I dare say, that Sasha never had a bitter antagonist in our movement. Berkman was a fine combination of an active rebel and a clear intellectual thinker. His work among us has been appreciated, and will be appreciated, as years pass by -- as long as Anarchism is propagated. To the last hours of his life he worked for the Ideal, to which he had consecrated his life. 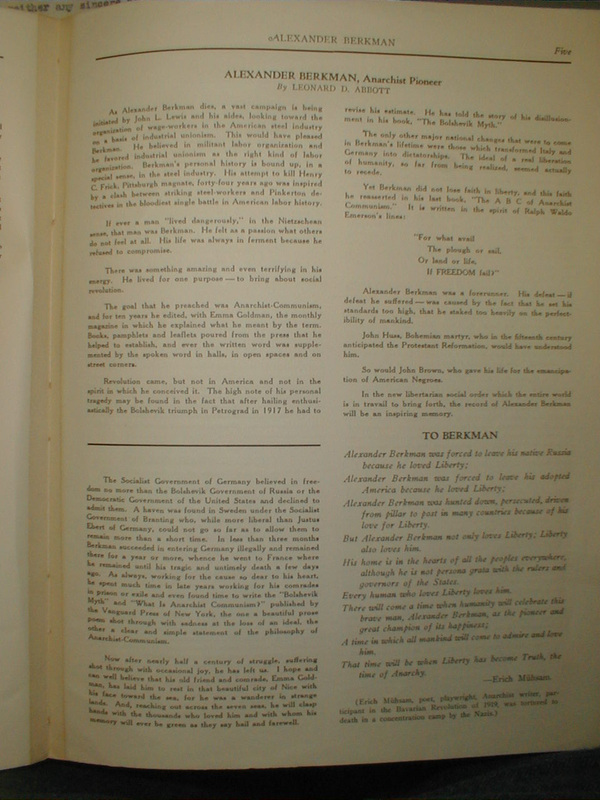 Berkman's "Prison Memoirs," "The Bolshevik Myth" and the "A.B.C. of Anarchism" will remain standard works in our movement. Although deported from our country, he belonged to the last hour in his journey on this planet, to the Anarchist Movement in America. His death closes one of the heroic periods of our movement in this country. And what a coincidence! Alexander Berkman dies at the hour when the struggle against the Steel Barons breaks out anew. It was at the seat of the mighty in Pittsburgh that he struck at the oligarchy and it was here that he suffered so many years of martyrdom. Facing today a new ordeal, the Steel Workers ought to keep the name of Alexander Berkman as a symbol in their hearts and an ensign of victory. IT is an ironic commentary on life that the same papers that carried the news of Alexander Berkman's death --- 375 papers throughout the country, we are told --- also carried full-page paid advertisements of the Steel Barons that they would resist the unionization of the steel industry. Ironic, too, that this resistance is to be made in the name of liberty. It is forty-four years ago almost to the day that the great strike at Homestead began --- a never-to-be-forgotten chapter in the annals of the labor movement of his county. With that strike a boy scarcely out of his teens was skyrocketed to fame and immortality. Just as the bloodhounds of the law in the Haymarket riots have been forgotten and their victims, the Chicago Martyrs, are remembered and cherished over every land and sea, just so will Alexander Berkman be remembered long after H. C. Frick and Andrew Carnegie --- for all their libraries and art treasures --- have been forgotten. To fulfill to the hilt the high expectations roused by a youth of 21, already execrated by his enemies and idolized by his admirers, is a rare phenomenon. Berkman rose above the highest. To suffer fourteen years of prison, with months, even years, of solitary confinement; to undergo the humiliation and the refined torture which prison officials know only too well how to inflict, without being broken in spirit as well as body is rare indeed. Sasha did this, and, after a few months of rest and recuperation, he began where he had left off fourteen years before, mind enriched and better equipped to carry the message of freedom and well-being for all to the down-trodden of every land. Truly, mind triumphed over matter during those fourteen years in prison! A raw and inexperienced youth entered that jail; a really fine scholar and mature man came out of that ordeal, conscious of the task before him, and determined to go on to the end. The thirty years following his release make so gorgeous a tapestry when viewed in retrospect, that I cannot even begin to do it justice. The wanderings along the Bowery at night to see and talk with those lost souls who had shared his prison life; and the months in the woods outside Ossining and in the barn in the tiny hamlet of "Tea Town" writing his prison memoirs which, when they were finally finished, astonished us by their erudition and power of its moving prose. 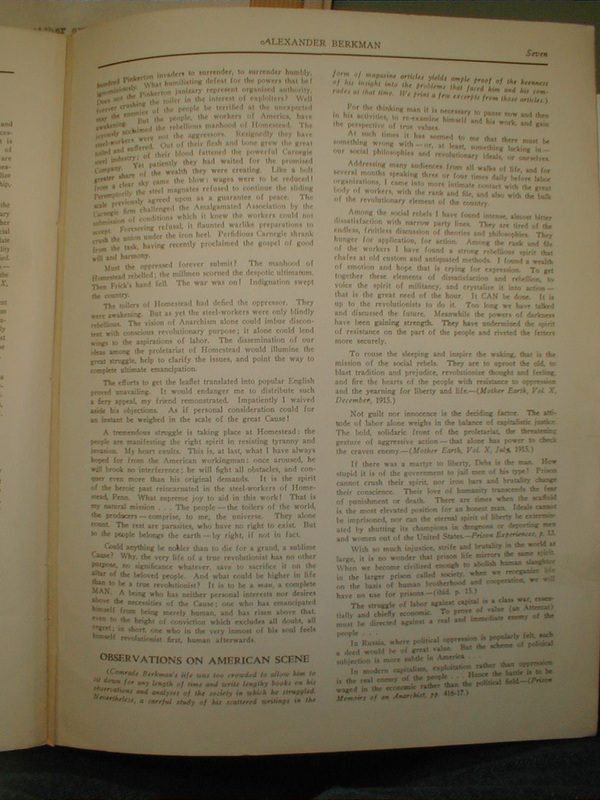 The editing of "Mother Earth," his active and vital participation in the labor movement of the day and his sympathy, understanding and idealism endeared him to thousands. Years passed and the shadow of war reared its head, and with that shadow came increased activity. What was it that he said or did that caused him to be sent to a federal prison at Atlanta, Georgia, for two years, seven months of which were spent in solitary confinement? Nothing more than Wilson himself was compelled to admit two or three years later, namely, that the war was fought for markets and profits. It is a dangerous business to be even an hour ahead of one's time, but two or three years is ofttimes fatal. So, Berkman, with his comrade at arms, Emma Goldman, had to pay, and pay heavily, for not only seeing but telling people what he saw: the "idealist"-become-despot, Wilson sent him to jail. And still Berkman could not keep quiet nor stand idly by while others were ill-treated. One of his outstanding characteristics was his inability to "mind his own business." When prison guards gave vent to their brutality on helpless prisoners he could not remain silent, for he truly believed in and acted on the principle credited to Christ that he was his brother's keeper. His interference cost him dear, and he paid heavily, just as, years before, he had paid in the penitentiary in western Pennsylvania. But everything must end, and at long last his term at Atlanta ended. Then he and Emma Goldman, acting as they had so often done before, went on a final tear, spreading the propaganda of their ideas. They did this after two trying years in federal prisons and with only a few months of freedom before their deportation and permanent exile from the country to which they had devoted the most fruitful years of their lives. Characteristic of their revolutionary intransigeance was their ability to rise above their personal difficulties, and to hurl themselves once more into the thick of a final struggle. Deportation to Russia did not loom as a tragedy, for these two intrepid souls fondly believed they could find a place in Russia where they could be useful to their fellow men and women. But disillusionment awaited them there as it had here. They found a growing dictatorship and destruction of liberty, and after two years in Russia they could stand it no longer. Applying for passports to Germany as delegates to the Anarchist Congress during Christmas Week of 1921-22, they set out. As Alexander Berkman dies, a vast campaign is being initiated by John L. Lewis and his aides, looking toward the organization of wage-workers in the American steel industry on a basis of industrial unionism. This would have pleased Berkman. He believed in militant labor organization and he favored industrial unionism as the right kind of labor organization. Berkman's personal history is bound up, in a special sense, in the steel industry. His attempt to kill Henry C. Frick, Pittsburgh magnate, forty-four years ago was inspired by a clash between striking steel-workers and Pinkerton detectives in the bloodiest single battle in American labor history. If ever a man "lived dangerously," in the Nietzschean sense, that man was Berkman. He felt as a passion what others do not feel at all. His life was always in ferment because he refused to compromise. There was something amazing and even terrifying in his energy. He lived for one purpose --- to bring about social revolution. 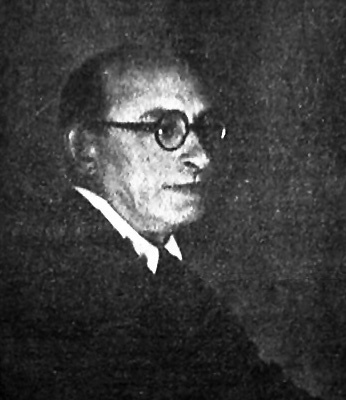 The goal that he preached was Anarchist-Communism, and for ten years he edited, with Emma Goldman, the monthly magazine in which he explained what he meant by the term. Books, pamphlets and leaflets poured from the press that he helped to establish, and ever the written word was supplemented by the spoken word in halls, in open spaces and on street corners. Revolution came, but not in America and not in the spirit in which he conceived it. The high note of his personal tragedy may be found in the fact that after hailing enthusiastically the Bolshevik triumph in Petrograd in 1917 he had to revise his estimate. He has told the story of his disillusionment in his book, "The Bolshevik Myth." The only other major national changes that were to come in Berkman's lifetime were those which transformed Italy and Germany into dictatorships. The ideal of a real liberation of humanity, so far from being realized, seemed actually to recede. Alexander Berkman was a forerunner. His defeat --- if defeat he suffered --- was caused by the fact that he set his standards too high, that he staked too heavily on the perfectibility of mankind. John Huss, Bohemian martyr, who in the fifteenth century anticipated the Protestant Reformation, would have understood him. So would John Brown, who gave his life for the emancipation of American Negroes. In the new libertarian social order which the entire world is in travail to bring forth, the record of Alexander Berkman will be an inspiring memory. The Socialist Government of Germany believed in freedom no more than the Bolshevik Government of Russia or the Democratic Government of the United States and declined to admit them. A haven was found in Sweden under the Socialist Government of Branting who, while more liberal than Justus Ebert* of Germany, could not go far as to allow them to remain more than a short time. In less than three months Berkman succeeded in entering Germany illegally and remained there for a year or more, whence he went to France where he remained until his tragic and untimely death a few days ago. As always, working for the cause so dear to his heart, he spent much time in late years working for his comrades in prison or exile and even found time to write the "Bolshevik Myth" and "What Is Anarchist Communism?" published by the Vanguard Press of New York, the one a beautiful prose poem shot through with sadness at the loss of an ideal, the other a clear and simple statement of the philosophy of Anarchist-Communism. Now after nearly half a century of struggle, suffering shot through with occasional joy, he has left us. I hope and can well believe that his old friend and comrade, Emma Goldman, has laid him to rest in that beautiful city of Nice with his face toward the sea, for he was a wanderer in strange lands. And, reaching out across the seven seas, he will clasp hands with the thousands who loved him and with whom his memory will ever be green as they say hail and farewell. Although Comrade Berkman has separated from us by thousands of miles since his deportation in 1919, we have always felt his presence in our midst. Neither time nor distance could take him from us. We understand fully why Alexander Berkman committed his last fatal act. Victim of a horrible illness, condemned as he was to a life of total inactivity he, who had always been accustomed to an independent and dynamic life, could not bear the thought of such an existence. So he took that last independent step. We know it to be the truth that Alexander Berkman is loved and respected not only by his Anarchist comrades, but by the thousands of men and women with whom he came into contact in this country and abroad during the course of his inspiring revolutionary activities. And we also know that millions of others who never had the good fortune to meet him personally, have heard of him and his devoted life, and love and respect him for it. We live on the eve of tremendous social changes. --- Anti-Climax, page 28. Not over night, nor from over the mountains, Messiah-like, comes revolution, much less the Social Revolution. If the latter means a complete and lasting social change, a fundamental reorganization of life based on the revaluation of popular ideas and conceptions, then it necessitates the gradual --- primarily individual --- substitution of new values for old ones. I take the paper from her hands. In growing excitement I read a vivid account of the tremendous struggle, the Homestead strikers, or, more correctly, the lockout. 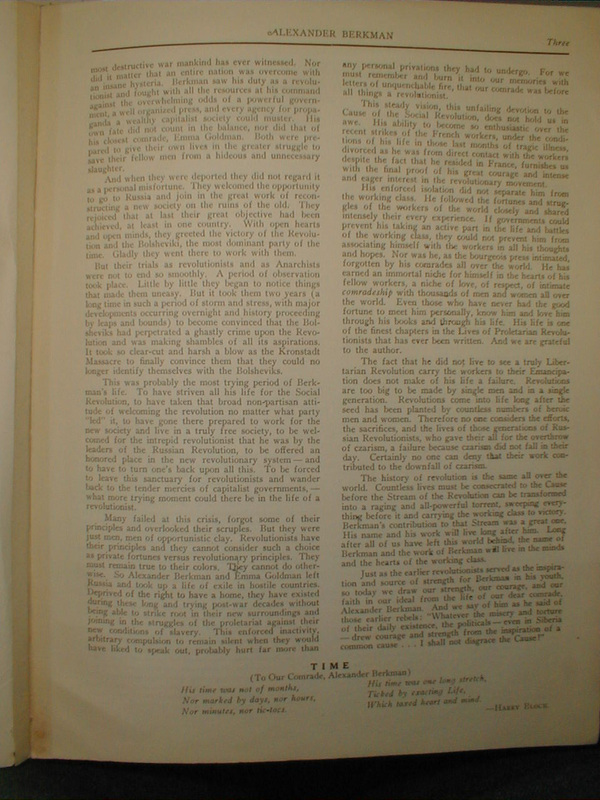 The report details the conspiracy on the part of the Carnegie Company to rush the Amalgamated association of Iron and Steel workers; the selection, for the purpose of Henry Frick, whose attitude toward labor is implacably hostile; his secret military preparations while designedly prolonging the peace negotiations with the Amalgamated; the fortification of the Homestead steel-works; the erection of a high board fence, capped by barbed wire and provided with loopholes for sharpshooters; the hiring of an army of Pinkerton thugs; the attempt to smuggle them in the dead of night into Homestead; and finally, the terrible carnage. *News item, July 6, 1892.
hundred Pinkerton invaders to surrender, to surrender humbly, ignominiously. What humiliating defeat for the powers that be! Does not the Pinkerton janizary represent organized authority, forever crushing the toiler in the interest of exploiters? Well may the enemies of the people be terrified at the unexpected awakening. But the people, the workers of America, have joyously acclaimed the rebellious manhood of Homestead. The steel-workers were not the aggressors. Resignedly they have toiled and suffered. Out of their flesh and bone grew the great steel industry; of their blood fattened the powerful Carnegie Company. Yet patiently they had waited for the promised greater share of the wealth they were creating. Like a bolt from a clear sky came the blow: wages were to be reduced! Peremptorily the steel magnates refused to continue the sliding scale previously agreed upon as a guarantee of peace. The Carnegie firm challenged the Amalgamated Association by the submission of conditions which it knew the workers could not accept. Foreseeing refusal, it flaunted warlike preparations to crush the union under the iron heel. Perfidious Carnegie shrank from the task, having recently proclaimed the gospel of good will and harmony. Must the oppressed forever submit? The manhood of Homestead rebeled; the millmen scorned the despotic ultimatum. Then Frick's hand fell. The war was on! Indignation swept the country. The toilers of Homestead had defied the oppressor. They were awakening. But as yet the steel-workers were only blindly rebellious. The vision of Anarchism alone could lend wings to the aspirations of labor. The dissemination of our ideas among the proletariat of Homestead would illumine the great struggle, help to clarify the issues, and point the way to complete ultimate emancipation. The efforts to get the leaflet translated into popular English proved unavailing. It would endanger me to distribute such a fiery appeal, my friend remonstrated. Impatiently I waived aside his objections. As if personal consideration could for an instant be weighed in the scale of the great Cause! A tremendous struggle is taking place at Homestead: the people are manifesting the right spirit in resisting tyranny and invasion. My heart exults. This is, at last, what I have always hoped for from the American workingman: once aroused, he will brook no interference; he will fight all obstacles, and conquer even more than his original demands. It is the spirit of the heroic past reincarnated in the steel-workers of Homestead, Penn. What supreme joy to aid in this work! That is my natural mission . . . The people --- the toilers of the world, the producers --- comprise, to me, the universe. They alone count. The rest are parasites, who have no right to exist. But to the people belongs the earth --- by right, if not in fact. Could anything be nobler than to die for a grand, a sublime Cause? Why, the very life of a true revolutionist has no other purpose, no significance whatever, save to sacrifice it on the alter of the beloved people. And what could be higher in life than to be a true revolutionist? It is to be a man, a complete MAN. A being who has neither personal interests nor desires above the necessities of the Cause; one who has emancipated himself from being merely human, and has risen above that, even to the height of conviction which excludes all doubt, all regret; in short, one who in the very inmost of his soul feels himself revolutionist first, human afterwards. For the thinking man it is necessary to pause now and then in his activities, to re-examine himself and his work, and gain the perspective of true values. At such times it has seemed to me that there must be something wrong with --- or, at least, something lacking in --- our social philosophies and revolutionary ideals, or ourselves. 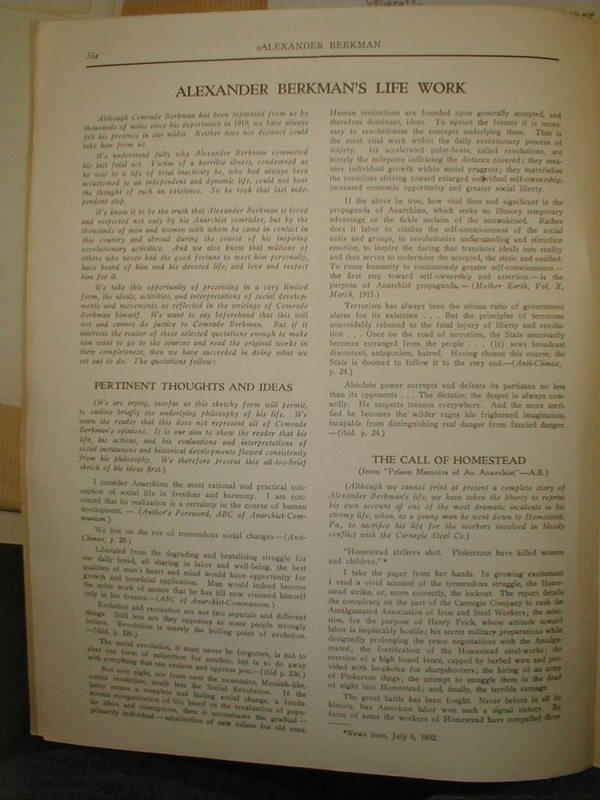 Addressing many audiences from all walks of life, and for several months speaking three or four times daily before labor organizations, I came into more intimate contact with the great body of workers, with the rank and file, and also with the bulk of the revolutionary element of the country. Among the social rebels I have found intense, almost bitter dissatisfaction with narrow party lines. They are tired of the endless, fruitless discussion of theories and philosophies. They hunger for application, for action. Among the rank and file of the workers I have found a strong rebellious spirit that chafes at old custom and antiquated methods. I found a wealth of emotion and hope that is crying for expression. To get together these elements of dissatisfaction and rebellion, to voice the spirit of militancy, and crystalize it into action --- that is the great need of the hour. It CAN be done. It is up to the revolutionists to do it. Too long we have talked and discussed the future. Meanwhile the powers of darkness have been gaining strength. They have undermined the spirit of resistance on the part of the people and riveted the fetters more securely. If there was a martyr to liberty, Debs is the man. How stupid it is of the government to jail men of this type! Prison cannot crush their spirit, nor iron bars and brutality change their conscience. Their love of humanity transcends the fear of punishment or death. There are times when the scaffold is the most elevated position for an honest man. Ideals cannot be imprisoned, nor can the eternal spirit of liberty be exterminated by shutting its champions in dungeons or deporting men and women out of the United States. --- Prison Experiences, p.13. The struggle of labor against capital is a class war, essentially and chiefly economic. To prove the value (an Attentat) must be directed against a real and immediate enemy of the people . . . In Russia, where political oppression is popularly felt, such a deed would be of great value. But the scheme of political subjection is more subtle in America . . . The Revolution instinctively followed the path marked out by the great popular outburst naturally reflecting Anarchist tendencies. It destroyed the old State mechanism and proclaimed in political life the principle of the federation of Soviets . . . In the field of economic reconstruction the Revolution established shop and factory committees for the management of production. House committees looked after the proper assignment of living quarters. The fundamental characteristics of Bolshevik psychology is distrust of the masses . . . The masses must be made free by force.
. . . (But) the Bolsheviki steadily gained momentum on the inclined plane of tyranny; the party dictatorship became the irresponsible absolutism of a few overlords; the apostles of liberty turned executioners of the people. Bolshevism, with its party dictatorship and State Communism, is not and can never become the threshold of a free, nonauthoritarian Communist society, because the very essence and nature of governmental, compulsory Communism excludes such an evolution. Its economic and political centralization, its governmentalisation and bureaucratisation of every sphere of activity and effort, its inevitable militarization and degradation of the human spirit mechanically destroy every germ of a new life and extinguish the stimuli of creative, constructive work . . .
Bulletin for the Anarcho-Communist and Anarcho-Syndicalist Prisoners of the Soviet Union. His books and pamphlets have been translated into various languages. *The reference is to Friedrich Ebert, head of the German Social Democratic Party and first president of the Weimar Republic, not our Fellow Worker Ebert. --Thanks to Jim Crutchfield for pointing out this error in the original, Anarchy Archives. This page has been accessed by visitors outside of Pitzer College times since December 27, 2000.